9/20/15 Game Preview: Sabathia vs. Harvey, Tejada leads off vs. lefty | We Gotta Believe! The Mets (84-64) take on the Yankees (81-66) tonight at 8:08 at Citi Field, broadcast on ESPN. CC Sabathia (4.93 ERA, 4.69 FIP, 1.42 WHIP, 149 2/3 IP over 26 starts) takes on Matt Harvey (2.88 ERA, 3.30 FIP, 1.04 WHIP, 171 2/3 IP over 26 starts). The Mets look to take the rubber game of the series. The Mets have a magic number of 8, and they are looking to lower it. After wins by Washington both yesterday and today, the Mets have a 6.5 game lead with 14 games to play, good for a magic number of 8. Of note for the Mets, Carlos Torres may be available out of the bullpen soon. Also, Jacob deGrom‘s start on Tuesday will be skipped in favor of Logan Verrett, in order to preserve deGrom’s innings. Verrett may make his start on Wednesday instead of Tuesday, in order to have Bartolo Colon go on regular rest. As a reminder, Harvey will be going half outings the rest of the way, meaning he may only go 4-5 innings tonight. I’m sure that is also context and pitch count dependent. UPDATE: Tyler Clippard is available to pitch tonight and Jacob deGrom will be pushed back, not skipped. It appears Verrett will start on Tuesday. Ruben Tejada is batting leadoff for the Mets for only the 2nd time this season. In that one game (also against a lefty), Tejada was 1 for 3 with a walk and a sacrifice fly in a 6-2 Mets victory behind Matt Harvey against the Diamondbacks. Tejada, for the season, has reached base at a .348 clip against lefties, better than usual leadoff men Curtis Granderson (.261 vs. LHP) and Juan Lagares (.331 vs. LHP). With Juan Lagares struggling of late, it makes sense to flip them in the order (especially considering Ruben Tejada walks a lot more than Juan Lagares). Matt Harvey struggled mightily in his last start against Washington, but much of that was a result of Yoenis Cespedes’s misplay in center field. 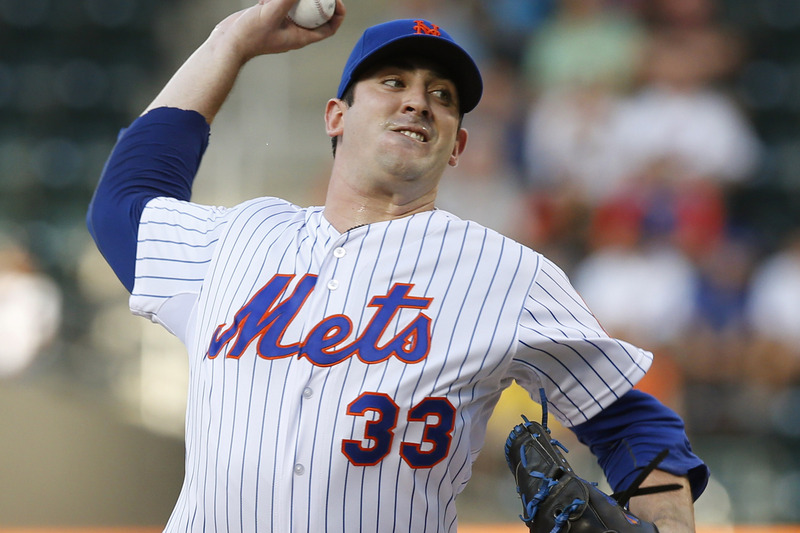 After being skipped last time through the rotation, Harvey is pitching on 11 days’ rest. For his career with 6+ days of rest, Harvey has a 1.51 ERA over 83 2/3 IP over 13 starts, with 29 walks and 103 strikeouts (a WHIP of 0.92). Though he will be facing a lefty only lineup (.303 wOBA against vs. lefties with 15 of his 18 HR allowed this season), he will be pitching at home, where he has a 2.47 ERA and a WHIP of 0.98 over 102 IP. Also, Harvey dials it up in high leverage situations, allowing a .158 wOBA against in 53 plate appearances this season. (Harvey’s wOBA against for the entire season is .272). CC Sabathia has had a rough time of it this year, but he has certainly pitched better of late. Over 6 starts since August 6th, Sabathia has a 2.76 ERA over 32 2/3 IP (though his FIP and xFIP are higher, at 3.94 and 4.63, respectively). Look for that to play a role at Citi Field, which has played slightly more home-run-friendly than league average this season (especially for righties, which the Mets lineup is stacked with today). Sabathia has allowed 23 of his 26 home runs this season to right handed batters, who have a wOBA of .370 against him. Sabathia also holds righties to a 1.59 WHIP, compared to 0.80 vs. lefties.